I've been creeping on Emily's blog again, this time for a Meatless Monday breakfast-for-dinner, originally "Creamy White Beans with Rosemary". 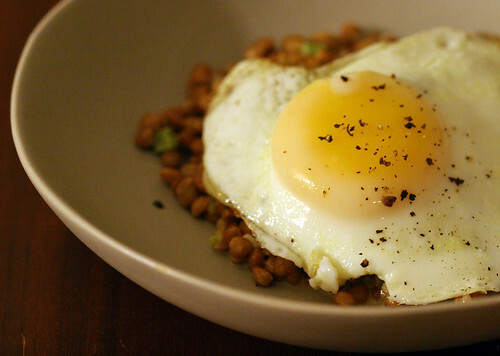 I did a little substituting here -- lentils instead of white beans, dried rosemary instead of fresh, green peppers instead of celery, and a fried egg because I don't currently have the patience to learn how to poach one. But it still turned out very nice. 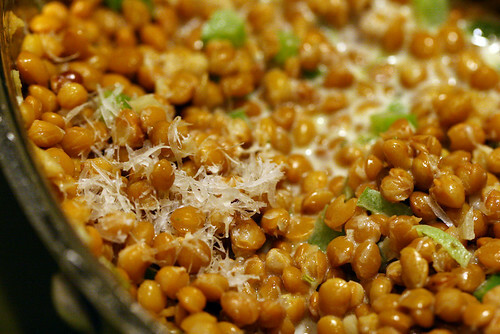 Other ingredients include: garlic, anchovy, dijon mustard, nutmeg, cream and Parmesan cheese. This is not unlike a family favourite, a little something I call "Lentils & Eggs", but with a few new and interesting flavours. [Note that when I made Lentils & Eggs in the above link, I "didn't have the time or patience" to learn how to cook an egg sunny-side-up. Progress!] See Emily's recipe here! Yay! I will have to make it with lentils and see how it compares - I'll bet it's great. And though I don't really think you're stalking me, that sort of thing is always welcome because it makes me feel loved and needed.